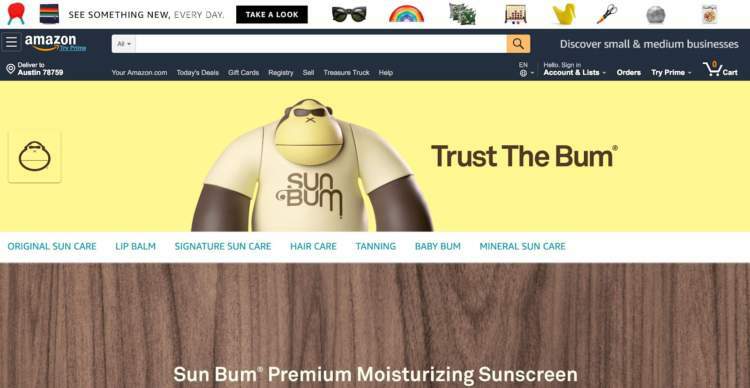 Amazon itself, which sells a vast range of products. Third-party retailers, who typically specialize in one or more categories. Since there is no limit to the number of sellers who can use the Amazon platform, multiple merchants frequently sell the same item. These sellers are known as resellers (as compared to private label selling in which you sell a proprietary item). When multiple Amazon resellers are selling at the same time, suddenly there is competition for which seller will win the Buy Box. 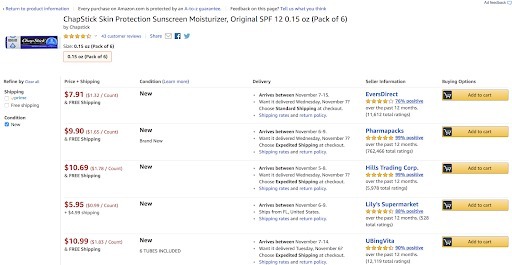 The Buy Box refers to the white box on the right side of the Amazon product detail page, where customers can add items for purchase to their cart. Not all sellers are eligible to win the Buy Box. Thanks to stiff competition and Amazon’s customer-obsessed approach, only businesses with excellent seller metrics stand a chance to win a share of this valuable real estate. 82% of Amazon sales go through the Buy Box, and the percentage is even higher for mobile purchases. Understanding the way Amazon’s algorithms function will allow you to work toward increasing your performance on relevant variables, ultimately increasing your chances of winning the Buy Box and beating the competition. What Happened to Perfect Order Percentage Score? This metric, which used to have a high impact on the Buy Box, has been removed from Seller Central. We explain this further in this guide, and walk you through Shipping Time as the newest, very important factor in winning the Buy Box. Introducing the Buy Box for Books: Amazon introduced a Buy Box for new books, allowing booksellers to compete with Amazon for the first time. An Increase in Price Wars: This past year has seen an upswing in price wars, indicating that winning the Buy Box has become even more competitive than before. New Research About the Buy Box:Northeastern University’s recent study explores the link between algorithmic repricing, higher prices and winning the Buy Box. While we refer to the goal of winning the Buy Box, it’s perhaps more accurate to say that a seller wins or loses a share of the Buy Box. Once a merchant has passed Amazon’s minimum eligibility requirements, the Buy Box algorithm further breaks down the sellers according to different variables. 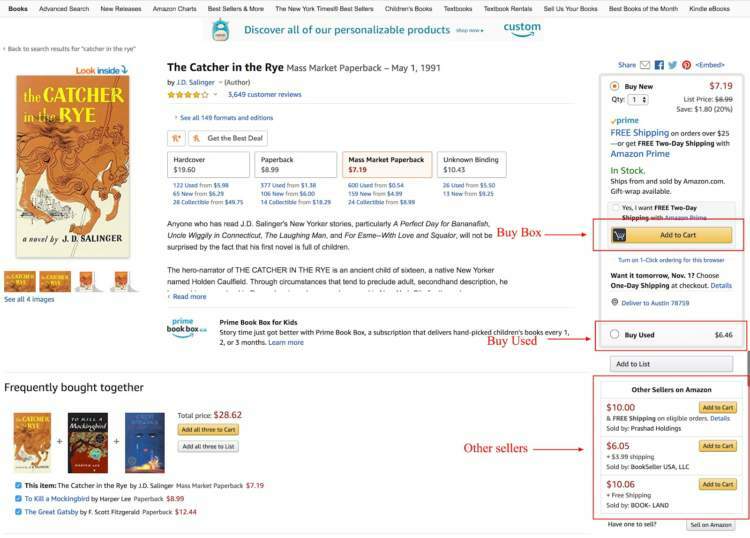 Amazon puts the competitors against each other to determine how they hold up on each variable for the same product. For more popular items with many sellers, multiple merchants may rotate their spot on the Buy Box. If one seller is stronger than the rest, their percentage share of the Buy Box will be higher. For example, the top-ranking seller of a product could hold the Buy Box for 70% of the day, while the lower-ranking seller could hold it for the remaining 30% of the day. Ultimately, Amazon tries to balance giving the consumer the best value for their money. This is done by weighing low prices with high seller metrics. What this means, among other things, is that if you have near-perfect performance metrics, you may be able to price higher and still obtain the Buy Box. Whereas if you have mid-range metrics, you’ll probably need to focus on offering the most competitive price. There isn’t one magic element, but a whole host of factors that go into deciding who wins. Well, doesn’t that only work if I’m competing against other third-party sellers? But what about when the competitor is Amazon itself? Hasn’t Amazon perfected its customer performance metrics? Well, it’s true that Amazon is hard to beat. But if you have great metrics, as well as very low prices, it is possible. At the very least, you can share the Buy Box with Amazon. What Makes You Buy Box Eligible? What are the requirements for competing for the Buy Box? Only sellers who have purchased a Professional Seller account (in Europe called a Pro-Merchant account) are eligible. An individual seller (in Europe: Basic account) is not. 2. Buy Box eligibility status. Your status can be checked in Amazon Seller Central. Your item must be new. Used items aren’t eligible for the regular Buy Box, though they can be sold on a separate Buy Used Box. There needs to be inventory of your listed item. Without stock, the Buy Box will simply rotate to another seller. Winning the Buy Box is not the only way to sell on Amazon. While these aren’t as profitable as the Buy Box, they will still give you a degree of visibility and credibility. 1. Other Sellers on Amazon. Right under the Buy Box is a listing of up to three select listings. These listings must still meet all the above Buy Box requirements. While not as visible as the Buy Box, these do have a greater chance of conversion than those prices or brands not showing up at all. This page lists all the sellers who sell a particular product, regardless of whether they’re Buy Box eligible. Offerings are displayed in order of Landed Price (price + shipping). Customers can also see other seller variables, including buyer feedback and rebate policies. More customers than ever are shopping on Amazon via mobile. In mobile, the Buy Box takes on heightened importance. That’s because, unlike on a desktop or laptop, the mobile site features the Buy Box directly under the product image. Customers click “Buy now” to place their order, without the Offer Listing page being in their line of sight. First and foremost, here’s a quick little takeaway for you – the Buy Box Cheat Sheet of all thematics that matter to get your brand in the box. 1. Fulfillment By Amazon (FBA). 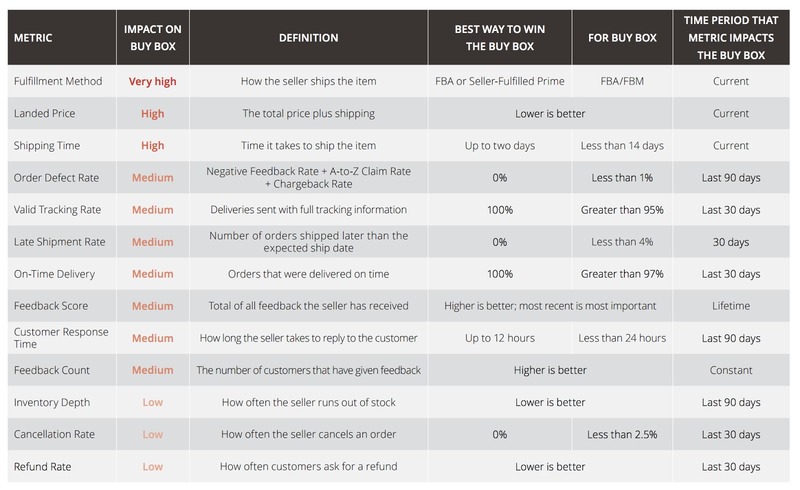 The variable that has the greatest impact on the Buy Box is the product’s fulfillment method. Since Amazon considers its fulfillment service to have perfect metrics across variables, using Fulfillment By Amazon (FBA) is the easiest way to increase your chances of winning the Buy Box. That’s not to say that Fulfillment By Merchant (FBM) sellers can never beat FBA sellers; it’s just harder, requiring extremely high scores across all variables and a very low price. Even though FBA is often a smart choice, you still need to look at the big picture to evaluate whether it will save or cost you in the end. Seller-Fulfilled Prime offers top-performing Fulfillment By Merchant (FBM) sellers the opportunity to fulfill their orders while enjoying the benefits of Amazon Prime. You maintain control over your own shipment, which is especially good for sellers with heavy products, who can use this method to bypass FBA’s extra fees. You will also benefit by having a higher chance to win the Buy Box and getting access to Prime members. The only potential downside is that not all FBM sellers are eligible for this method. Very strong overall metrics are a must if you want to qualify. The landed price refers to the total price an Amazon product goes for, including shipping. The lower the landed price, the greater the Buy Box share. If you have higher performance metrics than your direct competitors, you can also price higher and retain your share of the Buy Box. If, however, your competitors have better metrics, you’ll need to price down to maintain the same Buy Box share. The go-to method of pricing for many sellers has been to lower their prices beyond that of their competitors to increase their chances of securing the Buy Box. However, this does not always translate into higher profits for reasons described below. Manual repricing involves manually updating your prices for each ASIN. It’s an ideal option for sellers of homemade or unique goods but proves inefficient and inaccurate for sellers of competitive items. As your business grows, this method is generally considered unsustainable. Rule-based repricing examines the prices of the competition and re-prices according to predefined rules. For example, you can set a rule that beats the competitor by a certain amount or stay in the lowest price bracket. By only looking into competitors’ pricing, it is limited in its capabilities. Setting up the rules is a time-consuming task, and rules can come into conflict with each other, requiring excessive management. Finally, rule-based repricers often leave money on the table because sellers who could afford to price higher (due to high seller metrics) and still maintain their share of the Buy Box, don’t. And it tends to create price wars, with all sellers constantly lowering their prices, ultimately driving profits down for everyone. Algorithmic repricing is considered the most sophisticated and revolutionary repricing option. Unlike rule-based repricing, which only focuses on the competitors’ prices, algorithmic repricing takes into account all the variables that affect your chances of winning the Buy Box. A 2017 Northeastern University study found a direct correlation between algorithmic repricing, higher Buy Box share and increased profitability. By monitoring a wide range of important factors, it ensures that you are striking the right balance between Buy Box share and profit. This data-driven approach has been proven to deliver the highest ROI for merchants, as it requires less effort and yields better results. This repricing method is, however, the most expensive out of all the available options, and is, therefore, best suited for larger sellers who are already turning high profits. There is no one trick to beating the Buy Box, but rather a complex web of metrics to be monitored and improved upon. Concentrating on the most important variables, such as becoming an FBA seller, having Prime-eligible products, perfecting your customer service, and understanding the way pricing works are all key to snagging that coveted Buy Box real estate. In the end, you’re going to have to be algorithmic about your strategy – the same way Amazon is. “If you’re that one lucky seller who gets the ‘Buy Box,’ you make all the sales,” says assistant professor Christo Wilson, lead researcher of the Northeastern University study.